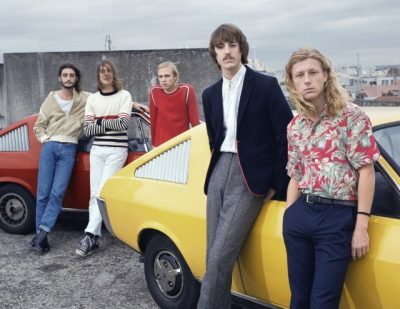 Parcels – this year’s summer anthem? Australian-born and Berlin-based band Parcels may very well be responsible for this summer’s anthem. Listener’s to their track ‘Overnight’ may well hear a similarity to 2013’s summer anthem ‘Get Lucky’ (which was 2013’s Festive Fifty no.1). Australian band Parcels aren’t particularly well-known in the UK at the moment. ‘Overnight’ was produced by Thomas Bangalter and Guy-Manuel de Homem-Christo – aka Daft Punk, the same act responsible for ‘Get Lucky.’ There’s no denying that the two French legends contribute to the magic made available for your ears here. It’s clear if you check out Parcels’ Hideout EP from earlier this year (which you can do at the bottom of this post) that the vibe of chilled music for the dancefloor with Nile Rogers-style choppy guitars is still Parcels. No doubt that’s why it’s credited to Parcels – even if a Daft Punk credit in the name might grab people’s attention more immediately. Put simply ‘Overnight’ is a genius piece of pop music, for the heart and the feet. You’ll hear it on the dancefloors, out of every other car window, from the mobile phones of the kids down your local park. Who knows, even your local radio station with the really conservative playlist will probably get behind it (once it’s charted, obviously). Special thanks to Liam O’Hare who tipped me off about this track in the first place. This entry was posted in Daft Punk, Parcels by Ed. Bookmark the permalink.